Pork really is a great meat that provides plenty of hugely beneficial nutrients. Pork is a main ingredient for many favourite dishes and there are so many recipes which would not be complete without using this fantastic meat. If you want to get the most from this superb meat then the following tips should be able to help. – If you want to lose weight then you would be best sticking to pork loin cuts. Any excess fat however should also be trimmed off the meat. If you are stewing the meat they should let the water settle for a while and remove the brown substance that rises to the top of the water this is fat. – A temperature of 160 degrees Fahrenheit or 71 degrees Celsius should be used whenever you cook pork. This will help you to make sure that the meat is safe for consumption because it will be fully cooked. It is also suggested that you cook pork for twenty minutes per pound of meat. – Purchase a meat thermometer to always ensure that your pork has reached the right temperature. – You could be risking food poisoning if you re-freeze pork again once you have defrosted it so this should never ever be done. – Make sure that you get rid of any fresh pork from your fridge if you have not consumed it within four days of cooking it. But it is possible for you to store it in your freezer for about six months. 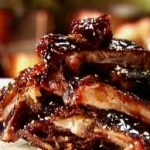 – To make sure that pork on the bone is really tasty, you need to cook it very slowly as this softens up the collagen. – Boiling or grilling pork instead of frying is a much healthier way to eat it. You should avoid eating too much pork that has used oil during the cooking process if you are trying to lose weight. So when it comes to cooking and eating pork the tips above should make sure that you really do get the most from it. When it comes to people’s favourite food, one thing that is always near the top of the list is pork. And it is for this very reason of it being extremely popular that there is always call for pork recipes. Irrespective of the pork meals you deem as your favourite, it is always good to know how to make pork loin recipes.